X-City. Genosha Attack Minus Five Minutes. Rachel and Beast talking about their new recruits. Apparently, Beast has gone back in time and taken – Thunderbird, Wolverine and Banshee – all before their deaths in Giant Size X-Men, which is a weird place to state when they could have died. Beast wanted to prove that it was possible, which really seems to lower the stakes, for this series. If people die, then Beast can just bring them back. I get that the ones with the extinction virus, that wouldn’t be an option for them, as they would just die again, from the virus. It is an odd inclusion. Why even bring it up, it must be important later but it is teased here. The attack happens, like it did last issue. We get Kitty and Lockheed(!) in the fight! It was a pretty good week for Lockheed, appearing in this title and in Years of Future Past 2. 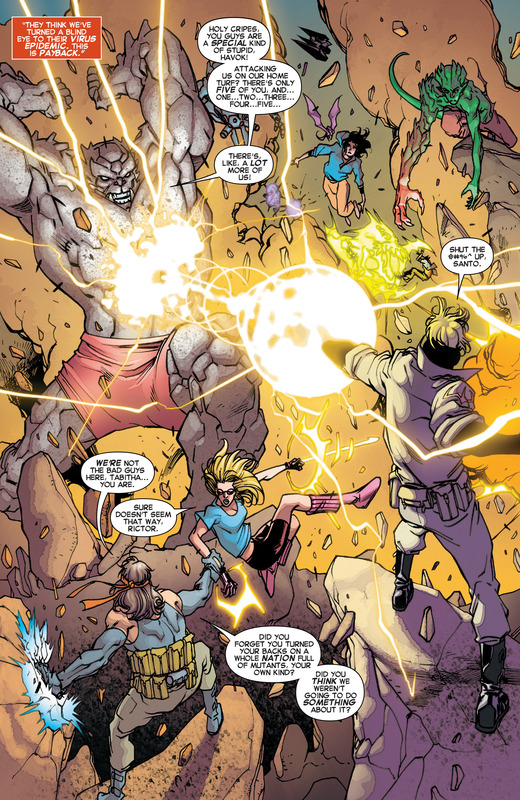 Rictor and Meltdown do end up confronting each other. Rachel summons her X-Men to the baseball field. Poor Kitty AND Lockheed take a direct hit of Havok’s cosmic blast – but no one mentions Lockheed again. I hope the little guy is okay! Rogue tells Nightcrawler to get Kitty to the Infirmary. X-City. Scott Summers Memorial Hospital. Kurt asks Dr. Reyes to heal Kitty. Dr. Reyes does a scan and reveals that Kitty has a punctured lung, pneumothorax and a ton of internal bleeding. Reyes needs Kurt to bring her, Triage. Which makes sense. Rogue fastballs Wolverine, which he isn’t familiar with the term. If he’s been dead for the past twenty years of publication history, would the X-Men even have come up with the, fastball special? 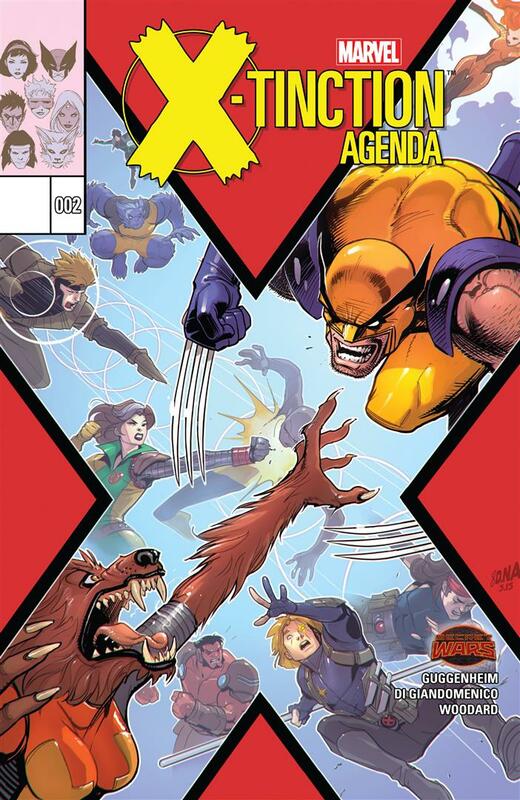 Wolverine being gone from all of those storylines, is too big of a deal to just add to this title. So many implications that will never be addressed – most likely. Havok and his team have lost their quinjet and scramble to come up with a new plan. Rachel tries to harass Havok and Rahne but they get Wicked to have ghosts from Rachel’s past haunt her. Rachel freaks out from seeing the ghosts of her parents and grandparents. Karma is on Havok’s side and starts taking control of peeps – first up, is Rogue. Rogue absorbs Rachel’s powers. Kurt arrives, and I can’t find Kitty anywhere on the page so I’m not including it. Dr. Reyes confirms that Triage is who he says he is, which surprises him. 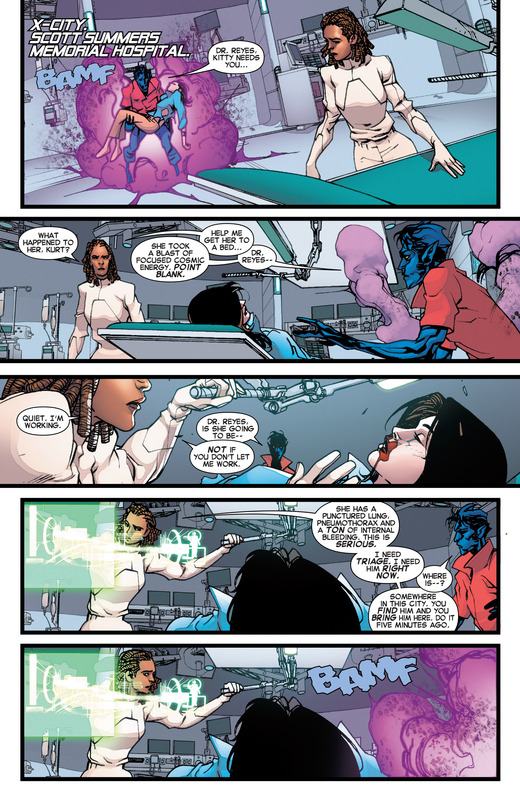 What really surprises both Triage and Nightcrawler, is that Dr. Reyes knocks both of them out. Dr. Reyes is really . . . Mystique! dun dun DUN! 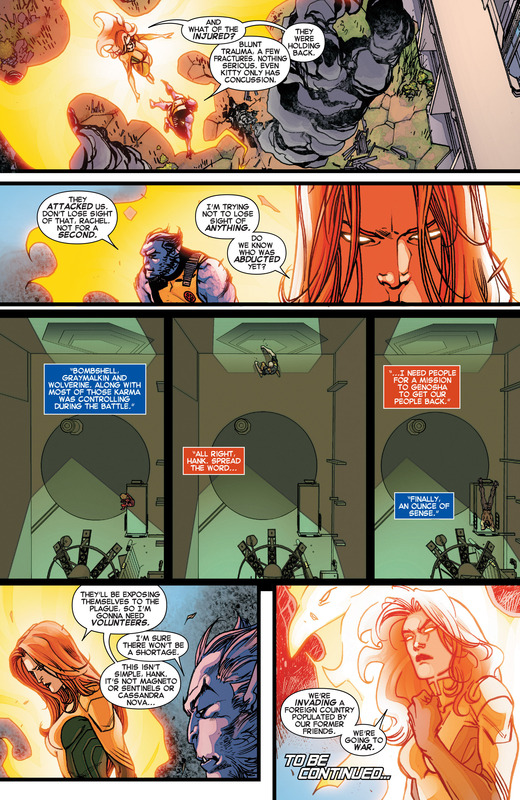 Havok tells Mystique that she has to come to them. Rogue starts taking out fools, and Karma also takes over Beast. Mystique arrives on the baseball (battle) field and Tempus (who is also on Team Havok) teleports everyone back to Genosha. 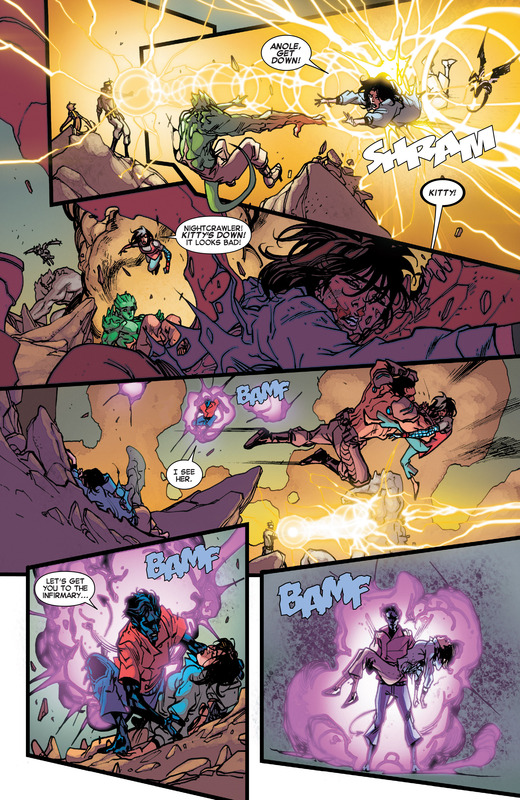 Wolverine jumps into the portal energy so he is gone, as well. Everyone who is back, feels pretty bad about having to attack their friends, but if they were real friends, they would have not forced their hands. The Genengineer hooks Triage to the machines, to see how the best way to use his powers. But what he really wants, is to use Triage’s power to cure a virus but not the extinction virus – but the virus called, mutants!!! dun dun DUN!!! Back at the X-City. Rachel and Beast are regrouping. Beast is worried as, if anyone was infected, they could have infected some of the mutants in the city. Issue ends with Beast revealing there were no serious injuries. Even Kitty only has a concussion, so I’m going to assume Lockheed is okay too. Next issue should deal with the team of volunteers that Rachel is going to use to go to Genosha and get their friends back – Bombshell, Graymalkin and Wolveine (also those Karma was controlling). So now the story is going to repeat some of the original X-Tinction Agenda, with the X-Men having to go to Genosha and get their friends back. Will Kitty be on this new away team? Will we see Lockheed with a bandage on his wing? Time will tell!